In 2004, privately-owned SiteGround was founded in a dorm room by a group of university tech wizards. Truly a global player, SiteGround is headquartered in Bulgaria (which has been called the Silicon Valley of the Eastern Bloc countries) and has servers in Chicago, Amsterdam and Singapore. It’s hard to find complaints about this host; customers are usually very satisfied with the service. Does SiteGround live up to its stellar reputation? Shared hosting is available in three plans. StartUp: one website, 10GB disk space and unlimited bandwidth. Grow Big: unlimited websites, 20GB disk space, unlimited bandwidth and premium features, including priority tech support, greater speed and a free SSL certificate for one year. GoGeek: unlimited websites, 30GB disk space, unlimited bandwidth and geeky advanced features, which include fewer accounts on the server, advanced hardware, free PCI compliance, and pre-installed Git and Staging. Please Note: WordPress and Joomla hosting is available, but they are essentially the same plans, with some specialized features, as the shared hosting plans listed above. The names and prices are also the same as shared hosting plans. Cloud hosting plans come in four variants. Entry: 1×3.0 GHz CPU, 2GB DDR3 RAM, 20GB disk space and 5TB bandwidth. Business: 2×3.0 GHz CPU, 2GB DDR3 RAM, 40GB disk space and 5TB bandwidth. Business Plus: 2×3.0 GHz CPU, 3GB DDR3 RAM, 60GB disk space and 5TB bandwidth. Enterprise: 4×3.0 GHz CPU, 4GB DDR3 RAM, 800GB disk space and 5TB bandwidth. Dedicated hosting plans are available in three variations. Entry Server: Intel Xeon E3-1230 CPU, 3.20 GHz CPU clock speed, 4 CPU cores, 4GB DDR3 RAM, 500GB SATA II HDD and 5 TB bandwidth. Power Server: Intel Xeon E3-1270 CPU, 3.50 GHz CPU clock speed, 4 CPU cores, 12GB DDR3 RAM, 1 TB SATA II HDD and 5 TB bandwidth. Enterprise Server: 2 x Intel Xeon E5-2620 CPU, 2.00GHz CPU clock speed, 2 x 6 CPU cores, 16GB DDR3 RAM, 4 x 500GB SATA II HDD and 5TB bandwidth. Reseller hosting: 10GB of disk space, unlimited data transfer, 3 server locations and around 10,000 visits per month. The only unusual step you’ll take during signup is choosing which datacenter you want to locate your website on. Your three option are the U.S., Europe (Netherlands) and Asia (Singapore). Then you’ll go through the standard exchange of personal information and billing methods. After these steps are completed, you’ll get your username. Just type in your password and you’re ready to go. At first impression, the cluttered site can be confusing. The homepage of the User’s Area is one big up-selling page. Sure, it’s convenient if you’re thinking about buying something extra, but after you get settled in, you’ll want to get out the area as fast as you can. Never fear, though, you will find everything and you will get used to the layout. Seven big tabs at the top of the page are: Home, My Accounts, Support, Billing, Referral Deals, Add Services and Resources. As we mentioned, Home contains mostly promotional items and upselling; Add Services is about the same. Referral Deals almost falls into the same promotional category, because you can trade perks for referrals there. And Resources is an odd combination of coupons and tutorials. All in all, this group is always hustling to sell you more. However, Billing, Support, and My Accounts are self-explanatory and they are promotion-free. The easiest way to access the control panel is to go through User’s Area. There, under the My Account tab, you’ll spot the little red button at the top. Visually, it will seem like you didn’t leave User’s Area, which is aesthetically pleasing. It is a slightly modified version of the cPanel, so if you had any previous experience, you won’t feel out of place and if you are completely new to it, you’ll learn it pretty quickly. On the left side, are basic account information and some stats. But the main part of the monitor will be occupied by different tools. Although you can switch it up, it is curious to see Domains at the top. You will have everything you need, from Visitor Stats, Security, Backups Manager and Autoinstallers, to custom software solutions under the name 1H Software. For some reason, SiteGround likes to separate WordPress and Joomla. Usually, they’re both presented in the control panel, but here they get their own tabs and semi-specialized tools. If you want to dig deeper or work with other CMSs and scripts, there’s a whole Softaculos library. There you can find Magento, PrestaShop, Joomla and other useful tools. If you’re more independent, you can always use FTP and file manager. However, when it comes to website builder, there’s a brick wall. 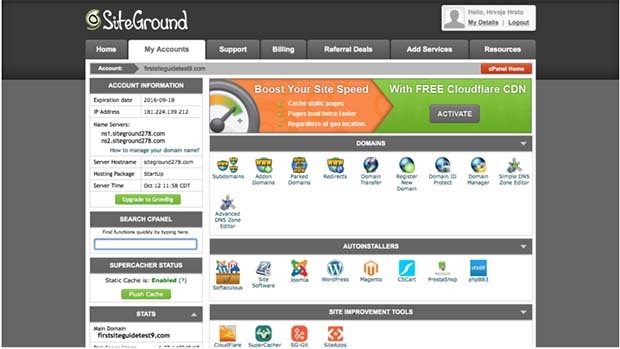 Currently, SiteGround doesn’t offer any website builder, although they did in the past. This isn’t that big a deal, considering their script library and the palette of CMSs there. Although there are no limits on how many email addresses you can have, they are limited to 500 MB per account. Arguably, that can be enough if you keep track of everything and regularly delete old emails. But we prefer to use our disk space in any ratio we choose. Email signup is pretty standard and you’ll be able to select from the typical webmail trifecta of Horde, RoundCube and SquirrelMail. You’ll be equipped with spam filters, auto responders and other basics—and a few more options, such as setting up a default address. We experienced 0-percent downtime during our test of approximately one week. That’s right, SiteGround’s uptime was 100 percent. That’s a claim that can seem a bit too optimistic and we don’t blame you if you are sceptical. However, bear in mind that some hosts can’t deliver 100 percent uptime, even in the duration of one week. We know; we tested quite a few of them. However, even if the downtime happens, we’re sure that in a more broad time period, downtime would not stray far from 99.99 percent. We’re not impressed easily, but when it comes to the SiteGround loading times and stress tests, we were…mega-impressed. The worst response came from Sydney and it was almost 1.6 seconds. Some hosts have an average response with that value, and the usual Sydney average time was 500 ms. However, our server was located in Chicago, so you need to calculate international distance. The U.S. response times were equally fast. On the West Coast, Palo Alto was consistent at around 250 ms and Portland a bit more inconsistent but moving between 100 ms and 400 ms. On the East Coast, Ashburn, Virginia was also slightly inconsistent, with response times between 100 ms and 600 ms, which was odd because it’s much closer to Chicago than Palo Alto or Portland. International response times were on par with everything we displayed. Fully 90 percent of the time, values were measured in milliseconds with the remaining 10 percent occasionally spiking around 1.5 second. Singapore was primarily around 600 ms with fluctuations between 500 ms and 1 s. Sao Paulo response was mostly 400 ms with a fluctuation range similar to Singapore and Tokyo. All in all, if your website can load under one second on average internationally, we think the job is pretty well done. Just as your User’s Area homepage is bombed with upselling messages, the Support tab is bombed with helpful tips and links. It’s a mix of help for both beginners and advanced users. From there, you’ll be able to access the most commonly used means of communication with support: a ticketing system and chat. There’s also telephone support and you can search their knowledge base from the Support tab. The only thing missing is community support, but we can’t complain much about it. Why? One word: chat. When it comes to chat, we must say right out of the bat, we had one of the most positive experiences with SiteGround. Their waiting times are below average; once we were connected within mere seconds. The staff is helpful and pleasant, and for some things, like uninstalling WordPress, all you have to do is state your wish and they’ll do it for you. And they will do it with a smile on their face, expressed with the emoticon :). Ticketing was on par with chat support standards. All in all, Support was the cherry on top of a banana split of solid services. You also have the option of creating your own cloud hosting plan with custom pricing. Just select your desired CPU, RAM and storage. Reseller hosting is the only one that comes in yearly rate and it can go as low as $42 per year. SiteGround will welcome you with a smile and take a good care of you along the way. It has great uptime and its loading times make roadrunner “meep-meep” sounds as they swiftly overtake Wiley Coyote. When something doesn’t go right, you’ll engage with support. Now, having a good support isn’t always an easy task. But having charming support took us totally by surprise. We couldn’t find many negatives or downsides to SiteGround. The only real bummer is the limited disk space in their lowest cost shared-hosting plan and the upselling at the User’s Area login. The absence of website builder and Windows servers may be bothersome to some people. Plus its ratio of price versus technical features, may make SiteGround slightly on the expensive side, but these aren’t major issues. All in all, we really liked SiteGround hosting. If you’re really annoyed by upselling or you’re a die-hard fan of Windows servers, you may want to look elsewhere. But, for everyone else, this service warrants serious consideration. JaguarPC Halloween Day Coupon : Get 20% Off on all VPS web hosting plans !